PETALING JAYA: AirAsiaGroup CEO Tan Sri Tony Fernandes has received another accolade after he was recognised by the US-Asean Business Council with the ‘Fourth Pillar’ award for contributing to the growth of US-Asean relationships. 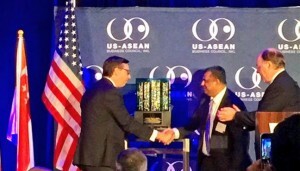 Tony was presented the award in San Francisco by Keith Williams, Chairman of the US-Asean business council, making him the second recipient of the award after President Barack Obama. A statement by AirAsia explained that the Asean charter speaks to a community comprising three pillars, namely political security, economic and socio-cultural. “The Fourth Pillar Award is presented to a person or organisation representing the “fourth pillar”, a person that has made an extraordinary contribution towards the growth of Asean as well as fostering better U.S.-Asean relationship,” said the statement. Tony, who spoke at the event, said combining all ten Asean countries into a single market and production base means tapping into a community of over 600 million people. “The potential this region holds is immense, and as a truly Asean brand, we will continue to lobby and spearhead Asean integration, especially but not limited to the aviation, travel and tourism industries. “I believe it is time for Asean to take a bold step towards commonality and standardisation. There is an urgent need of one Asean regulator to ensure a unified Asean standard. The current process of relying on consensus that require approval from all 10 countries should be reviewed so important initiatives move forward,” he said. He added that it was a true honour to be recognised by the U.S.-Asean Business Council for what he and his team had done. “Our hope is for all ten member countries’ governments to come together as harmonisation allows for more efficient use of resources,” he said.